Computer backups – I don’t need them. I mean I just have a few movies, pictures, and files on my computer. It is nothing important. Also, what’s going to happen to my computer? It stays at home all the time. It’s not like it will go for a walk and forget the way back home. It’s ridiculous for me to even think about backing up the computer. Oh boy! If you are aware of how unreliable technology can be, I am sure you don’t share the above sentiments. And God forbid, if you think PC backups are a waste of time and resources, then you are just waiting for the disaster to happen. Your data is constantly under threat from computer loss, theft, accidental deletion, natural disaster and many other possibilities. It is imperative for any computer or PC user to strategize a decent backup plan. It is a good thing if you have never faced such a situation even after years of using a computer but believe me you can lose your data in an instant. The disaster won’t take appointments from you or knock on your door to inform you about the computer crash that’s about to happen. Fortunately, there are many easy and efficient computer backup techniques available in the market. I will advise you to use multiple backup methods, but at least you should adopt one computer backup tactic. What Is Backing Up PC Data? Backing up means duplicating your data and storing it in different destinations other than the original location. Here particularly, I am referring to computer backups or PC backups. The process of backup includes copying all the files you have on your PC or laptop and saving it on different mediums. The purpose of backing up the data is to summon it up immediately if anything happens to the original files. The backup should be saved on different devices. For instance, you have a folder of childhood photographs, and you copy the folder to two different drives on your laptop. Now if your laptop is stolen then you lose the folder with everything else. So the destination of the backup should be distinct from the original one. Why Should You Backup Your Files? “It’s not a question if your PC hard drive will fail, but when.” This statement has perfectly summarized the reality of data loss and the need for computer backup. Most people still don’t seem convinced that their data can be lost forever. Well, let me give you more reasons to accept the fate of your data (if not backed up properly). I am pretty sure I am not telling you something out of the ordinary. Data is not always recoverable. Maybe your hard drive suffers a crash, and it is possible that a repair specialist may recover all the files or most of the files. But you cannot rule out the possibility of complete data loss. There is no such guarantee when it comes to recovering data from the damaged device. There is always a 50-50 possibility. You may get it all back, or you may lose it all. So why leave it on chances? It is much better to have a computer backup. I am sure you know a fair share of funny stories when someone spilled a drink on their laptop or how their laptop fell from the balcony by mistake. The truth is we all make stupid mistakes that put our laptops in danger. Of course, computer repair person works his or her magic and recover the important stuff, but sometimes you can damage a device beyond repair. Also, what about the mini-heart attack that you suffer when your laptop is dead or the hefty amount of bill that you have to pay for repairing services. Admit it, a lot of the pain can be reduced if you simply have a good computer backup. People may have a different idea for PC backups. I have met so many people who keep their files on USBs as a backing up mechanism, but most of them are lost because who can keep a USB save and alive for more than a year. There are other temporary storage options too. So if you do believe in computer backups but don’t choose the right method, then you are still in trouble. I cannot stress enough about the computer backups, but it is equally important to pick the right method for backing up the computer. Remember, we talked about the repair specialists in the last couple of pointers. Well, in this case, even a repair specialist cannot save you. Laptops are an expensive commodity, and they can be stolen by thieves to make some extra cash or worst case scenario, you may misplace them. This is absolutely the nastiest situation. You are bound to mourn this event for years. But if you have a proper computer backup, at least, you will be happy for the (un)lost data. A wise man once said it is good to prepare for the worst. So listen to this wise man and backup your laptop at any cost. Power failures may seem irrelevant to you, especially if you use a laptop but do not undervalue the damage that can be done by power failures. They can severely destroy the hard drive or motherboard of your computer. Again, you will be depending on the repair specialist and have a mini breakdown for the lost files and folders. Believe me; it would be a relief to have a duplicate of your data available to you all the time. What Are The Best Way To Back Up My Computer? You can backup your computer on an external drive. It can be anything, an external hard disk, memory card or a USB. The process is pretty simple and quick. You need to attach the device to your PC and run the inbuilt backup option like File History on Windows 8 and 10, Windows Backup on Windows 7, or Time Machine on Mac. Your backup will be ready on the external drive automatically. You should repeat the process once in a while or keep the device attached to the computer so that it can backup automatically. The advantage of this approach is that it is cheap and quick. You just need to buy a quality external drive, and that’s it. There are no significant security risks involve as well. You can keep your external drive password protected, and that would be enough. However, the downside is if you get robbed or (God forbid) your house catches fire then your external drive dies along with your computer. I personally don’t consider this method reliable in this regard. One of the ways to backup your computer is online storage services. You can avail any by paying a small monthly fee. A software will run in the background and will keep backing up data. The process will be automated. You don’t have to upload files manually. Online storage will require you to setup once and adjust settings and preferences and the rest will be automatic. Apparently, this method is the most reliable one. The advantages of online storage service are it keeps your data protected from all sorts of physical damages like a computer crash, loss, theft, fire or natural damage and it automates the process. Of course, the downside is that you have to pay a monthly fee. It can be a burden on your budget. People find it expensive to pay for online storage service. Also, the first backup will take a lot of time. You must also be prepared to pay extra internet bill for bandwidth used to upload the files from your PC to the online storage repository. Since you are putting your data in the hands of a third party, it automatically raises the concern of data security and exploitation. Online cloud backup service is also a legit way to backup your data. Instead of saving your files on hard drive, you can store it on the cloud. This way they will be available to you on all your devices, and if anything happens to your personal computer, you can easily access your data online. Cloud storage services like Dropbox, Google Drive, and Microsoft OneDrive offer lucrative paid and free packages. The cloud services will sync your data on all devices. For instance, if you have a Word file saved in the cloud and you edited it in your laptop and later accessed it on your mobile, you will find the edited version. So no matter what you do on one file, the changes will be reflected all across the connected devices. This computer backup technique is fast, easy and mostly free. Your data is also protected from physical damages to your device. The drawbacks of cloud storage are the free space is limited, and eventually, you have to upgrade to a paid package. Also, the presence of data security and exploitation is very much real in this case. So I have told you the best three methods to backup your PC. Each of them has many benefits and a few drawbacks too. However, the recommended way is to go for online backup services. The only real threat is the data security, but you can overcome that by selecting the right service provider. Most online storage providers are aware of customers’ concerns regarding data security, and that’s why they take extensive measures to minimize the threats as much as possible. Once you are sure about the method, the next logical step is to pick the right candidate for the job. Well, there are hundreds of online backup services. I have gathered the top five contenders. Why don’t you take a look? Crashplan can be your service provider for computer backup. It has a promising list of features. It offers unlimited storage space. 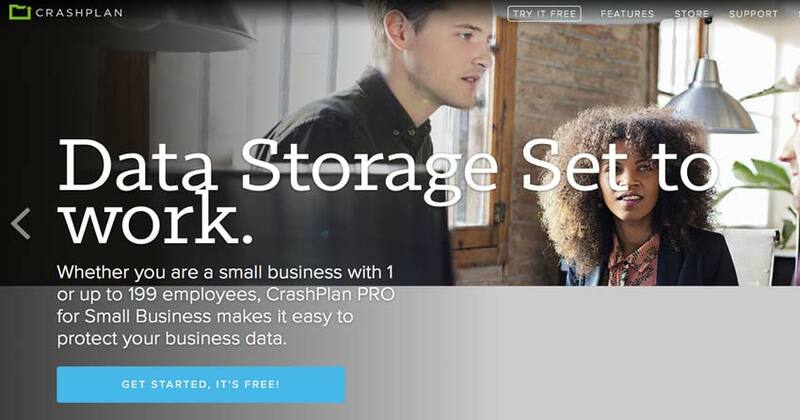 So no matter if you data exceeds the gigabytes or terabytes, Crashplan can accommodate you comfortably. Of course, I have talked about the security concerns. 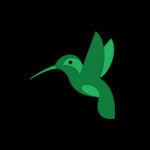 Crashplan knows that too and offers 448-bit encryption with an optional private key. This PC backup service provider also takes initiatives to ensure the military-grade security of its data centers. Crashplan also follows best industry practices of “power redundancy, cooling and fire protection.” Also, you can access all your files and folders anywhere on any device. 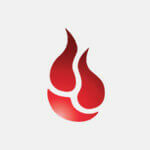 Backblaze is another reliable name in the computer backups world. It has an impressive and long list of valuable features that can woo any customer. If you have a file and you have revised it again and again, now suddenly you need an older version, but you can’t access it on your PC, don’t panic as Backblaze can restore multiple versions of the same file for 30 days. Backblaze gives you an option of backing up your data automatically on your scheduled time. You can change the settings to perform this function manually as well. Also, you can order a USB drive of your data from Backblaze for a small fee. Note: We have recently did a comparison of Crashplan and Backblaze to see which one works better for you. Check the ten deciding points of our comparison before you subscribe to any of them. 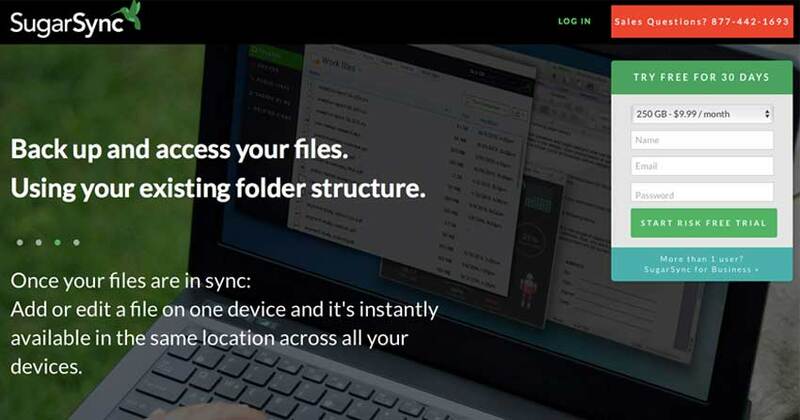 Carbonite can also be used to backup your photos, documents, music, videos, and entire computer. 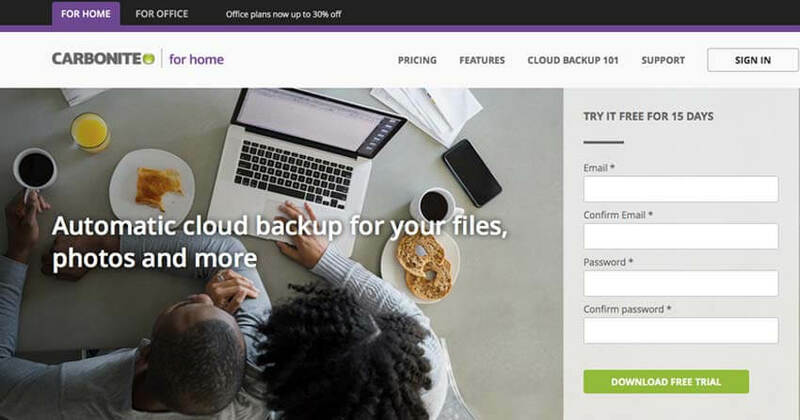 Carbonite knows that you are bound to lose files and folders at some point, but the duplicate will be safe and secure with this online backup service provider. Carbonite also allows you to access your files and folders by logging into your account from any device. Don’t worry about the security as Carbonite provides military-grade protection to all its users. It uses best encryption level and enough safety measures for its data centers. It also has an able customer support team to look after all your queries and confusions. 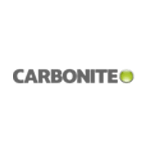 At least, there is no harm in checking out the features and services of Carbonite. SugarSync can perform its job in the background without interrupting your work. It also holds on to the different file versions for a limited time in case you may need it later. 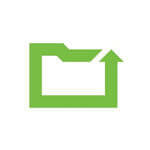 SugarSync also allows you to share files and folders quickly via various methods like public links. This online backup provider is also known to sync files across connected devices. Of course, SugarSync takes data protection seriously. It uses 256-bit encryption which is also used for online banking transactions. SugarSync has enhanced the role of mobile devices by allowing them to browse, access, backup and sync files, and folders. Let me tell you a story. Meet Linda. She is a struggling writer. After years of agony and pain, she finds a story to tell. She pours her heart and soul for two years to complete the first draft. Finally, her time comes to take that story to the next level. Unfortunately, she misplaces her laptop. Linda never thought of backing up her computer or even her novel’s file. Now, she is lost. All her time and efforts were wasted because she made the blunder of not backing up her laptop. Please don’t be Linda. Computer backups can save you from unexpected and abrupt online incidents. Whether you think you need it or not, PC backups are crucial and essential.